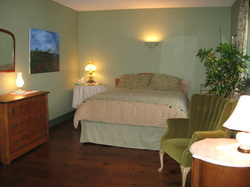 Large room with private sitting area, on second floor with a queen bed, dresser and night tables. Your private five piece bathroom is adjacent to the room. View from windows are south and westward towards mature deciduous trees, perennial garden, and pine forest. $165 per night + HST *Includes hot wholesome and health conscious breakfast. Secluded in our twenty acre forest beside a pond, this off-grid cabin offers a nostalgic taste of the past with unique features such as gas lighting and antique furniture. There is a queen bed, night tables, dresser, couch, coffee table and rocking chairs. There is no kitchen and no conventional plumbing. An outdoor compost toilet is only a few steps away and your private three piece bathroom is up at the main house. Listen to the sounds of nature and enjoy a small campfire under the stars. Your full breakfast is served at the main house. Note: In wet weather conditions access is by walking, no cars. $325 two night minimum + HST based on double occupancy adults only, sorry no pets. Add on nights $150/night. ***Also available for personal and small group day retreats. Please see 'Workshops, Retreats, and Personal Retreats page. For your sleeping comfort, our bed linens are a high thread-count cotton bedding with hypoallergenic pillows and duvets. In offering a quiet relaxed setting, our rooms are not equipped with a TV or radio. The Rhapsody Lounge in the main house has these available for your enjoyment. *We require a minimum 24 hours for bookings. ** Rates are in Canadian Dollars and are subject to 13% HST - Ontario's Harmonized Service Tax.